Click here for event results. Don't let the score line deceive you - this was a tight and brutal match lasting over 40 minutes. Both players are extremely fit and fast around the court so each point was contested as if it was match ball. Ted emerged victorious though to put him in a strong position for getting through to the final. The rest of the group matches were similarly as tight. Ted Jeal v Nick Bond was a closer affair in terms of the score, with Nick picking up a point against his opponent but not quite doing enough for the win. Ted was through to the winner’s group – so it was a fight for second place between Nick Bond and Peter Staunton when they came head to head. Peter eventually won the match 2-1 which left the players tied on points, Peter claiming the second place spot due to his win over Peter in this final match. Group B saw head coach of the host club, Jason Pike making his UK-Racketball debut alongside Ian Dinwiddy and Justin Monson. He wasn’t sure what to expect but he needn’t have been nervous as he played outstandingly well in the group stages. Unfortunately for Ian, he didn’t manage to pick up a win against Justin Monson, who won the match without dropping a game. This meant that it was two points all for Jason and Justin heading into their match – the winner would make it through to the winner’s group. Both fought hard but in the end Jason overcame his opponent to find himself in the winner’s group alongside top seed, Ted Jeal. Group C saw a slightly larger group face off against each other to fight for the place into the finals. Top seed of the group was Craig Chappel, alongside Thomas Murton, Craig Bartlett and Ross Proudfoot. The first match to go ahead was Craig Chappel v Tom Murton. If Craig felt the pressure of being the group’s top seed, he didn’t show it; his performance in the group stages was fantastic. He didn’t drop a single game to Tom, Craig Bartlett or Ross Proudfoot and stormed his way into the winner’s group. Craig Bartlett however was unfortunate in that, despite gaining the same points as the winners of the other groups by beating both Ross and Tom, the larger group size meant it just wasn’t quite enough. The winner’s group was so highly competitive this year, and the matches were long and tough. Considering it was his first UK Racketball event, Jason Pike put up a tough fight against number one seed Ted Jeal and managed to take the first game. But Ted was just too strong for him and ended up winning 2-1. When it came to his match against Craig, he had tired after a tough day of matches and Craig won 2-0. It all came down to the last match between Ted and Craig to decide who would be the A Grade Champion. The first game was tight and it was Craig who nicked it, 11-9. The second game swung the other way and Ted levelled the score at 1-1. Down to the wire in the third but it was Ted Jeal who walked away with his third UK-Racketball title in three events this year. “My first game with Jason was tough to start as I had injured my ankle in the group stage. He was doing loads of drops and I was struggling a bit. I had to change my game and go for the winners which fortunately worked well for me. “When I played Craig, he played similar to Jason; playing loads of drops and was really pushing me round the court well. His retrieval was unbelievable but it knackered him out. I pushed hard and played for the winners. I think in the end he was just a bit too tired and I was able to capitalise. “I really like the UK-Racketball events, not just for the competitive side but the social side too – everyone in racketball comes to these events! Group A saw Oliver Adams, Ian Scanlan, Joe Faulkner and Ryan Loska battle it out. Both Ian and Ryan succeeded over Oliver and Joe and it looked like this may be a tough call to decide who would emerge on top of Group A. However Ryan upped his performance and didn’t drop a game throughout any of his four group matches, earning his well-deserved place in the semi-final. It was a similar story in Group B, which was made up of Jonathon Round, Gary Slator, Peter Widdowson and Dan Lewis. Both Jon and Peter managed the win over Gary and Dan, levelling their points at 4-all. When it was time to go head to head, it was Jon who just edged it and made his way into the semi-final. Group C was the smallest group in the B Grade and saw young guns Alex Musselwhite and Billy Jones take on the UK-Racketball regular James Murphy. James was playing in both the B Grade and the Over 50’s – a tall order to be sure. Despite some tough matches, it was Billy who overcome both his opponents with a clean sweep and took the third place in the B Grade semi-final. 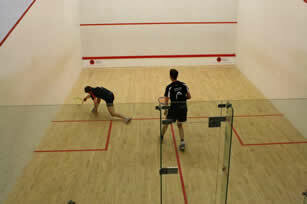 Group D saw Ian Furlonger as the top seed and he faced Serge Mbikina, Ben Masters and Matt Rushby. And what a group! I don’t think there was anthing as close as this in terms of the jostle for position one between Ian and Matt. Out of a possible six points up for grabs, it was Matt who prevailed with six points to Ian’s five. The first semi was between Ryan Loska and Jonathon Round. Despite some hard work put in by Jon, Ryan Loska continued his habit of not dropping a game on his pathway to the final. The second semi was between Billy Jones and Matt Rushby. This was pretty close and both players looked like they could have taken it. However, in the end Billy Jones prevailed with a 2-1 win over Matt. So the final was set – Ryan Loskaversus Billy Jones. Both players were on great form but Ryan seemed determined – as he won the match 2-0, he finished the Leamington Open without dropping a game throughout the entire tournament! Carolyn Lindsay was the top seed in Group A, taking on Nina Parker and Sarah Gill. Carolyn and Nina’s match was a tight affair that ended in a 2-1 victory for Carolyn. Sarah Gill fought hard but in the end the experience of the two other players proved just slightly too much for her. Carolyn won her group and took the first place in the winner’s group. Group B saw National U19’s Champion Matilda Parslow face UK-Racketball Series regular Jo Shelley, Gillian Gill and up-and-comer Charlotte Jagger. This was a tight and competitive group, with all players at least winning one match over the others. However, Matilda’s dominance was obvious and she led the group with full marks and a clean sheet. She was the next into the winner’s group. The top seed in Group C was Natalie Lawrence and she was joined by Chloe Widdowson, Claire Walker and Sue Smith. However no-one anticipated the ferocity of Claire who came out fighting and won the group without dropping a single game. She headed into the winner’s group to face Matilda and Carolyn. The Women’s winner’s group was so competitive at Leamington and all the games were tight. Despite this, it was Claire who emerged victorious, with Matilda coming a close second. Group A saw number one seed James Powley face Matthew Wixted and Phil Perchard. Without dropping a game, James headed into the semis, although Phil also picked up a good win against Matthew. The top seed of this group was also one of the tournament sponsors, Andy Murray. He came up against Clyde Finch and Alan Voyce. Andy faced strong resistance from Clyde and Alan to head into the first semi to face James Powley. Group C was made up of Marc Thornley, Mark Bradley and Chris Hawken. Series regular Marc Thornley was came top of the group and secured his place in the second sem-final. Group D consisted of Matt Pugh, Andy Flynn and David Morse. Matt, who entered the tournament without a current UK ranking, had tough opposition from two experienced and ranked players. However, he pulled it out the bag and topped his group, securing his place in the second semi-final against Marc Thornley. The first semi was between James Powley and Andy Murray – this isn’t the first time these two have played and this time it went the way of James, who won 2-0 to make it through to the final. The second semi was between Marc Thornley and Matt Pugh. This was a really close match but in the end, Matt made it through to the final after beating Marc 2-1. The final was between James Powley, currently ranked number 1 in the UK and Matt Pugh. The unranked player Matt had played valiantly throughout the entire tournament but in the end all his hard work slowed him down slightly and James took home the Over 40’s title after beating his opponent 2-0. Group A saw Janak Malkani face Greg Marsters, Paul Devey and Nick Tobin. Despite a serious threat from Nick, it was Janak who found his place into the winner’s group after he secured six points in group A. In Group B were Mike English, Stephen Uttley, Neil Jagger and Stuart Ferguson. It was Stuart who prevailed though, topping his group to take him through to the second sport in the winner’s group. James Murphy played his second grade of the day and was joined in group C by Gabriel Uttley, Mark Fitton and Peter Seddon. This was so so close and there was a real fight at the top of the table between Gabriel and James. However it was James who walked away with six points and Gabriel trailed with five – still respectable but not enough to get him into the winner’s group on this occasion. What a battle this group was! No-one was timing it but I’m sure Janak and Stuart’s match could have easily been the longest of the day. Despite playing in the B Grade as well, I don’t know where James found the energy as he battled on, but the day had clearly taken its toll and it wasn’t to be his day. Stuart fought on and beat both James and Janak to take the well-deserved and well fought for Over 50’s title! Group A in the Over 60’s was made up of Ian Graha, Jeff Lindsay and Ed Smith. Ian didn’t drop a game in his group which sent him to the top of the table and through to the final. Group B saw Roy Burns take on Alan Holder and Graham Greensall. This was really close and it came down to a point’s difference as to who went into the final – Roy Burns managed three points but Alan Holder edged it at four. This was a really great final between Alan Holder and Ian Graham. The first game was really tight and it was Ian who took it 11-8. Then Alan levelled it up with a storming second game! It was all on the third game which was the tightest of the match. 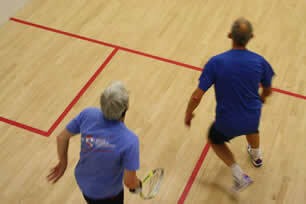 In the end it was Ian who edged it 11-9 to win the Over 60’s title. Report written by Victoria Clark. The newcomer to the UK-Racketball Series this year, the Leamington Racketball Open is the third event in Series. With the event taking place only two weeks before the National Championships it is bound to be competitive, with players looking to hone their skills just before the biggest tournament in the racketball world. Jason Pike the new head coach has already made a fantastic impact at the club with new junior sessions, club nights and even a PSA closed satellite event. The club looks to be going from strength to strength making it a very exciting new prospect for the UK-Racketball Series.